Do any of you know of any solutions? Are you admin on the computer? I'm sorry, I'm not too informed on this sort of thing. Would you be able to elaborate? I'm not too sure what you mean. Thanks for your assistance too! (05-26-2013, 10:53 PM)Black Ops Wrote: Are you admin on the computer? Yes I am, I have also "Ran as Administrator". Same result. (05-26-2013, 10:55 PM)RaikouPB Wrote: I'm sorry, I'm not too informed on this sort of thing. Would you be able to elaborate? I'm not too sure what you mean. Thanks for your assistance too! right click->new file->new text file. you only have a shortcut, here. The portable.ini is still being read as a Text File. It's because the extension is still .txt so go to Organize, then choose Folder and Search Options, then select view, untick "Hide Extensions for Known File Types". When you press Enter, Windows will ask if you're sure you wish to change the extension of the files, click Yes. 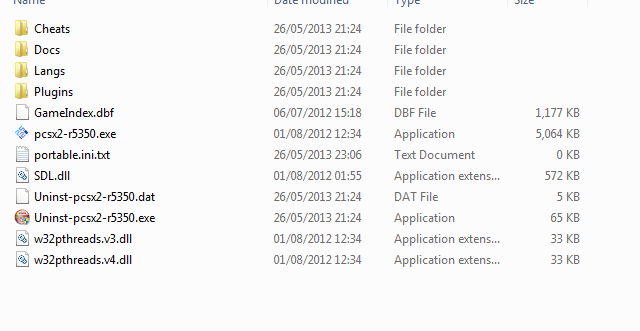 (05-27-2013, 12:59 AM)Zangetsu21 Wrote: The portable.ini is still being read as a Text File. It's because the extension is still .txt so go to Organize, then choose Folder and Search Options, then select view, untick "Hide Extensions for Known File Types". I did what you said, but it didn't ask me if I wished to change the extension, it just went straight to it. Same problem .